Wash off bubble mask enhance facial v-line by reducing facial fats & firming. Protect skin from harmful external environmental air. Stimulates oxygen delivery into your pores to clean and remove pore impurities- blackheads, whiteheads, powder clogged pores, etc. 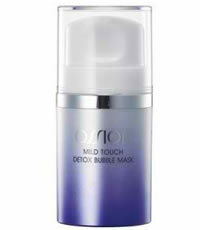 Helps cell renewal to improve and prevent dull and aging skin. Contains caffeine that enhance facial v-line, firm and reducing facial fats! Anyone who sweat, must use this! Prevent clogged pores, acne and pimples. – After cleansing, before applying any skin cares. – Everyday or 3 times per week. Either before going out or before sleeping. – Some users use this every single night to detox impurities and fully cleanse pore sebum inside out due to harmful external environmental condition. Recommend sensitive skin users to use 3 times per week. For faster facial v-line result, place 2 hands together at the wrist to form a v-shape and gently massage upwards the cheek bone. *Avoid mouth and eye areas. *The bubbling are oxygen bubbles and they clean the pores, you might feel a slight tingling during bubbling- not to worry it is caused by the bubbles and it is only temporary. This entry was posted in 1 and tagged Fr3b, Free giveaways, free samples, freebies, OSSION MILD TOUCH DETOX BUBBLE MASK, S’pores 1st Sampling Concept Store, singapore’s 1st online sampling platform, skincare, www.fr3b.com. Bookmark the permalink.